The American community criticized the strategy of giving absolute trust to Filipino officials yet Roosevelt, Jr., delivered. During his short term as Governor-General, he was able to make a full economic turnaround. Aside from the younger Roosevelt, two other names reverberate during these years. Manuel Quezon (1878-1943) is the Commonwealth’s Senate President who rose to power courtesy of his powerful oratory and his charismatic statements towards a full, immediate and complete independence. In both occasions, Osmeña and Quezon clashed over issues. However negative the situation maybe for the OsRox Mission, Quezon’s warning may be viewed on a different light. As Americans focused on the Great Depression, there might be an American majority who would want to dispose the Philippines. The American farmers viewed Philippine imports as competition. The same goes for the American unemployed who view the Filipino immigrant as a competitor in a very narrow job market. [x] Who wants a colony in a time of domestic financial issues? Better to keep the money at home than let it flow out. Honoring current trade agreements except for those involving the following products: raw and refined sugar, sugar, coconut oil and cordage (abaca). Despite the quantity limitations for certain Philippine products, the bill still faced the wrath of the American farmers who wanted to impose drastic measures on what is already a strong, protectionist American economic policy. This was not surprising as American farmers viewed Philippine products as fierce competitor in a time of Great Depression. Nevertheless, this is the same group who favor immediate Philippine independence. selling or leasing Philippine land for “coaling or naval stations”. This was still not the final version of the Hare Bill. The final one lowered the quota of coconut oil by a hundred thousand while that of abaca’s lowered by two million. The period of transition increased to eight years and the “yearly reduction in import quantities was eliminated.”[xvi] Further, Hawaii was excluded from the immigration clause. Republicans were against the Hare Bill but this did not stop the Democrats from drafting and finalizing the Hawes-Cutting Bill. The latter is in essence of the former. They differ in one thing: the date of independence. The Senate did not want to give a fixed date since there is uncertainty in Southeast Asia and there is still an economic depression. No one knows what the future might bring. America did not want to let go of the Philippines in a time of chaos so why place a specific date? The permit for America to retain and operate military and naval bases. There shall be an office for Financial Control whose main duty is to “duplicate copies of the Insular Auditor’s reports and hear appeals from the Auditor’s decision”. These did not sit well with Quezon and the OsRox Mission yet Sen. Hawes added them anyway. It will be almost two months before the HHC was finally called for debate. That time was enough for the political climate to change. Several senators were determined to block the bill by filibustering or by not attending the sessions set for debate. Other times, the bill is sent for committee amendments before it was scheduled for another debate then it was sent to the committee again. By the time the Senate adjourned for recess on December 1932, the OsRox Mission faced the reality of that change in political climate. There was a united front to defeat the Independence Bill and the American press led the way. The New York Times, New York Herald Tribune, Washington Post and several dailies published reports that the Filipinos were “no longer in favor of independence and were not in sympathy with the stand and activities of the Mission in Washington.”[xix] The only counter attack the Independence Mission can muster was to publish “official statements, letters and circulars” to newspaper editors. Their efforts eventually gained ground. The Senate finally passed the HHC on the same month. Among the finishing touches of the HHC were the Forbes amendments and the Filipino Chief Executive’s use of Malacañang Palace. Manuel Quezon was not pleased when Senators Osmeña and Roxas came home with the first Philippine Independence Bill. The clauses on Filipino autonomy, tariff limitations and military bases did not suit Quezon’s belief on full, non-negotiable and unequivocal independence. The disagreement caused the battle of newspaper chains in Philippine politics. Quezon’s leadership in the Senate was threatened when the Tribune-Vanguardia Taliba (TVT) sided with those in favor of the HHC. It did not help that Carlos P. Romulo was their publicist. Romulo and the Pros gained momentum when these newspapers published the OsRox Mission’s successes at Washington. Quezon looked like the villain since he knew through experience that whoever took home the Independence Bill has the greatest chance of being elected as the highest official in the land should America grant the founding of a Commonwealth government. Quezon wanted some changes in the HHC yet no one seemed to listen to him when he went to Washington on 25 April 1933. [xxiv] Congress made it clear that they together with their new President, Franklin Roosevelt (served 1933-1945), will “not act further on Philippine independence.”[xxv] Quezon got what he wanted, alright, but he wanted more. This did not sit well with the Americans who devoted so much time for debates on the Philippine question. That was when Quezon decided to throw away the HHC and with it, the OsRox Mission. It will be almost two months before the battle between Quezon and Osmeña reaches the public. Osmeña raised the question of conducting a plebiscite to know the voice of the people regarding the acceptance or rejection of the HHC. Quezon had no choice but to accept. Otherwise, he will look antidemocratic. [xxvi] Osmeña thought the plebiscite will settle his quandary with Quezon. He was wrong. Quezon manipulated not only the Senate but his network of alliances to rally with him in rejecting the HHC. Quezon knew that there must be unity on the Philippine front so he resorted to some not-so-good tactics to reach his goal. His opponents viewed this as one-man rule. Quezon calls this by another name: patriotism. In the end, Quezon won the clash of the scribes men. His victory, however, did not mean that American legislators would be on his side. Quezon returned to Washington anew and submitted amendments to the HHC Act. Yet American leaders retained their “Hare-Hawes-Cutting Act now or nothing for a while” sentiment. [xxviii] Two months will pass and Quezon, determined to bring home the bill of independence, met with Senator Millard Tydings to discuss the possibility of finding a “common meeting ground” of Congress and Quezon and the Osmeña-Quezon factions. By February 1933, Representative John McDuffie joined the discussion. The group decided to revive the HHC Act and amend the military bases clause so that these are subject to negotiations two years after the independence. [xxix] The new bill will contain the HHC Act in essence; changes are purely for cosmetics. President Roosevelt signed the Tydings-McDuffie Act on 24 March 1933. Almost a month after, Governor Frank Murphy called the Philippine Legislature for a special session to consider the Tydings-McDuffie Act. On 1 May 1933, the Philippine Legislature unanimously accepted it. Churchill, Bernardita Reyes. 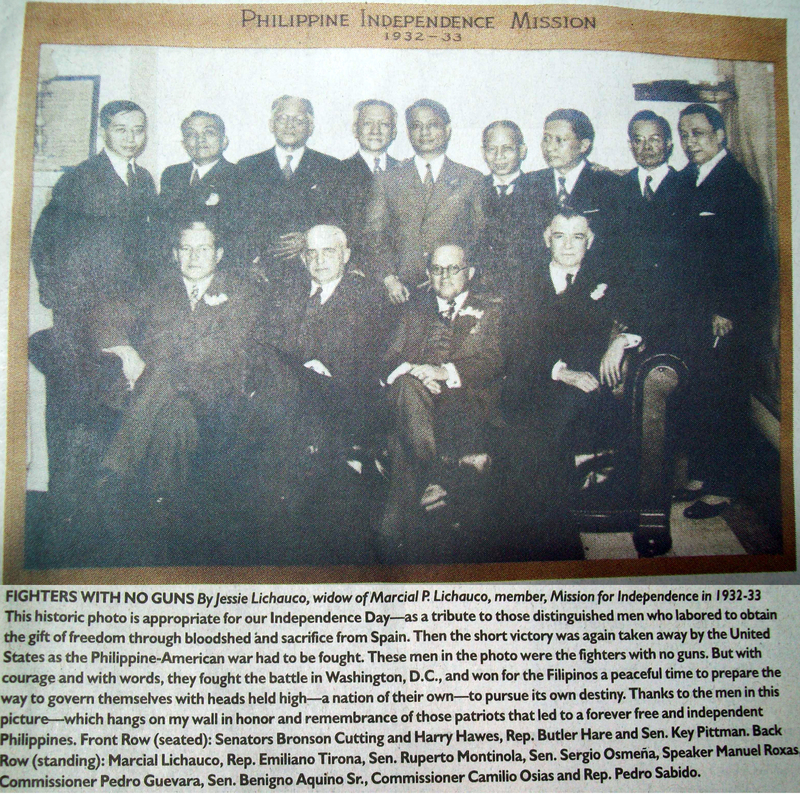 The Philippine Independence Missions to the United States 1919-1934, Manila: National Historical Institute, 1983. Gleeck, Jr., Lewis E.. General History of the Philippines Part V Vol. I The American Half Century (1898-1946). Quezon City: R. P. Garcia Publishing, Co., 1984. Hornedo, Florentino H., Ideas and Ideals Essays in Filipino Cognitive History. ( Manila: University of Santo Tomas Publishing House), 2001. Perry, Marvin, A History of the World Revised Edition, (Boston: Houghton Mifflin Company, 1989). [vii] Bernardita Reyes Churchill. The Philippine Independence Missions to the United States 1919-1934, Manila: National Historical Institute, 1983, p. 263. [viii] Perry, Op. cit., p. 686.